A pollen-covered bumblebee doing what it does best: pollinating. Here’s what it doesn’t do well: adapt to climate change. There’s plenty to grumble about if you’re a bumblebee. When humans aren’t mooching off your free pollination services, they’re blasting you with deadly, disorienting toxins or encroaching on your ever-dwindling wildflower habitats. * Plus, you’re constantly fighting off invasions of parasitic mites that threaten to collapse your colonies. All told, you and your brethren are dying out at rapid rates. As if that’s not enough, now bees have another thing to worry about: the rising heat. Bumblebees are facing critical declines across both Europe and North America due solely to climate change, reports a new global study published this week in Science. As temperatures rise, these humble bumblers are failing to migrate out of their homelands, which are rapidly becoming inhospitable to their survival. This is bad news for bumblebees, and it’s also terrible news for humans. So it’s doubly unfortunate to find out that these MVPs—most valuable pollinators—are rendered helpless in the face of climate change. Researchers looked at 67 species going back 110 years, to find that bumblebees have lost up to 300 kilometers from their southern ranges across both North America and Europe. At the same time as their southern habitats are being made unlivable, these bees are failing to move to more habitable northerly ranges. Thus their habitats are being compressed from both sides: Like Luke Skywalker & co. in the Death Star’s trash compactor, they’re being slowly squeezed into nonexistence. It’s not as if bees are the only ones facing these threats: Birds, butterflies, and other insects all have to adapt to the same changing climate. Yet many of these pollinators are doing just fine. Not to rub it in, but many species of butterflies are virtually thriving, embracing warmer temperatures and rapidly expanding north into new horizons. So why are bumblebees dragging their furry feet? Part of the answer lies in their evolutionary history. Butterflies evolved in the tropics, making them perfectly at home in the warmth and sunshine. Bumblebees, by contrast, originated in the cool conditions of the northern Palearctic zone. In other words, their biological machinery is ill-equipped for running in warmer climes. “Imagine a car that starts running out of coolant and steam starts coming out of the hood,” said University of Ottawa biologist and lead author of the new study Jeremy Kerr, at a press conference Wednesday. That’s the bumblebee, beaten and beleaguered. Another reason is the difficulties inherent to bee colonization. Bees are mobile little beasts, but it takes a lot to get them to settle down. Unlike butterflies, who just need a male and a female to get going, bees require a queen and a critical mass of new males to establish a colony. For this, they rely on seasonal cues: Bees forage in the spring and summer, and then produce new males and queens at summer’s end. When those seasonal cues are interrupted, delayed, or don’t happen due to climate change, bee colonies fail to take root. But is that really the most efficient path? UC Berkeley’s Kremen says we may need to build landscapes that would mitigate climate change for many species, not just one. 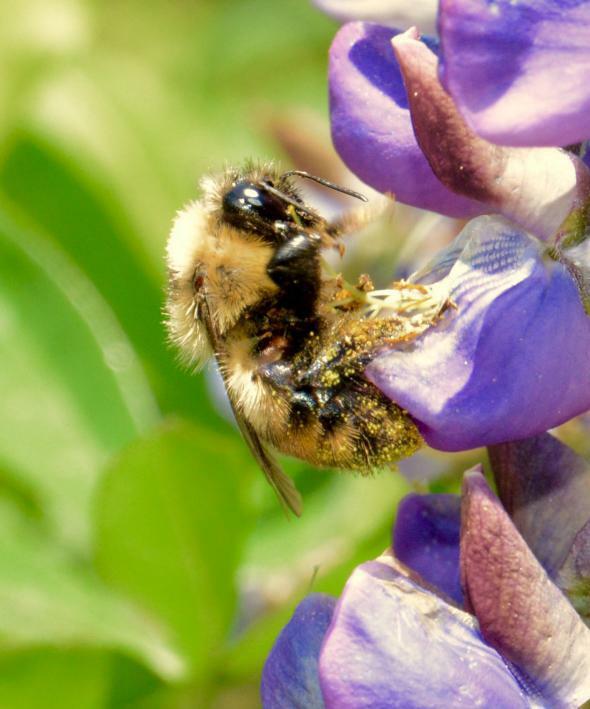 “It won’t just be bumblebees but many species that would need this kind of assist,” she says. In fact, that’s just what Obama’s task force has in mind: This summer it announced a plan to build an ambitious pollinator “highway”—a 1,500-mile corridor that would aid bees and butterflies in flying between Canada, the U.S., and Mexico. “Of course,” Kremen adds, “What we really need to do is deal with the root of the problem: our runaway consumption patterns that are causing this degree of climate change.” Until then, we’ll probably just keep bumbling about. *Correction, July 9, 2015: This article originally misstated that bumblebees are used for their honey services. They are actually used for pollination.